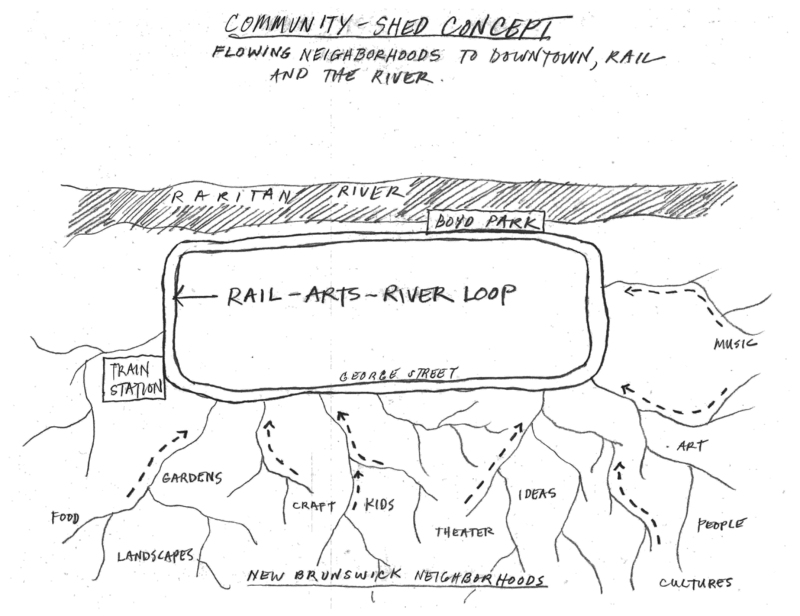 Rail→Arts→River is a new planning concept for the Lower Raritan Watershed that champions urban arts and riverfront recapture, focusing on communities dynamically connected to both the Raritan River and NJTransit’s commuter rail line. Rail→Arts→River emerges from local partnerships that nurture, encourage and invite creativity as an approach to integrated issues including economic development, social resiliency and ecological regeneration. Rail→Arts→River aims to advance the goals of regional economic development and partnership building around arts and the environment. As river then rail promoted settlement and development throughout the region, Rail→Arts→River celebrates the arts as economic driver and catalyst for a new wave of inclusive and inspired initiatives in our Lower Raritan Watershed communities. Important components of Rail→Arts→River include the use of the arts to communicate the ecological connections of our region, and integrating an artistic/landscape design perspective with grey/green infrastructure (e.g. water system/water flows) and other infrastructure interventions (e.g. lighting, transportation). The social design structures for Rail→Arts→River work from existing community, institutional and business resources to create an inclusive vision of regeneration between a frequently unseen Raritan River and our disconnected communities. The vision of dynamic Rail→Arts→River corridors mixes artistic surprise with functional impacts and heralds a socially and environmentally resilient future. In each Rail→Arts→River community installations will be new work that is distinct and underscores the local cultural leadership. Phase 1 involves using community outreach and performance pieces to cultivate a vision for improved rail to river flows. Phase 2 involves engaging our streetscapes as an artistic canvas for way-finding from rail to river using professional and community-inspired interventions to visually breach barriers and improve human and economic flows. The idea is to transfigure pedestrian streetscape features so as to visually narrate and enhance flows between cultural assets, focusing primarily on the connections between river and rail. Phase 3 involves installation of professionally engineered but artistically conceived green/grey infrastructure and other infrastructure improvements.